It is true that everything in Advent is so arranged as to be a preparation for the coming of the Saviour at the feast of Christmas, and that the spirit of the faithful should be one of earnest expectation of this same Saviour; and yet, such is the happy lot of the children of the new Law, that they can, if they wish it, really, and at once, receive this God whom the Church is expecting; and thus, this familiar visit of Jesus will become itself one of the preparations for His great and solemn visit. Let those, then, who are living the life of grace, and to whom the glorious day of the Nativity of our Lord Jesus Christ will bring an increase of spiritual life, not omit to prepare, by Communion, for the reception they intend to give to the heavenly Spouse on the sacred night of His coming. These Communions will be interviews with their divine Lord, giving them confidence, and love, and all those interior dispositions wherewith they would welcome Him who comes to load them with fresh grace, for this Jesus is full of grace and truth. They will understand this better by reflecting on the sentiments which the august Mother of Jesus had in her blessed soul during the time which preceded the divine birth. This birth is to be an event of more importance, both to the salvation of mankind and to Mary's own glory, than even that of the first accomplishment of the Incarnation; for the Word was made Flesh in order that He might be born. The immense happiness of holding in her arms her Son and her God, would make the sacred hour of Jesus' birth dearer and happier to Mary, than even that in which she was overshadowed by the Holy Ghost, and received from Him the divine fruit of her womb. During those nine months, when she knew that her Jesus was so undividedly hers, what must have been the happiness which filled her heart! It was a bliss which was a worthy preparation for that more blissful night of Bethlehem. Christians! your Communions during Advent are to prepare you for your Christmas joy, by giving you something of the delight which Mary felt before the birth of Jesus. Knowing that thou art about to enter under my roof, O eternal God, Jesus Son of the Father, I have need of all my faith. Yes, it is thou who art coming to me, thou who didst enter into Mary's virginal womb, making it the sanctuary of thy Majesty. Thou didst send thine angel to her, and she believed his word, when he said: 'Nothing is impossible to God: the Holy Ghost shall come upon thee, and the power of the Most High shall overshadow thee.' She believed, and then conceived in her chaste womb him who had created her. Thou hast not sent an angel to me, O my Saviour, to tell me thou art coming into my heart. Thou hast spoken thyself, and thou hast said: 'I am the living Bread come down from heaven: he that eateth my Flesh and drinketh my Blood, abideth in me and I in him.' Thou hast willed that these words of thine, spoken so many hundred years ago, should reach me by thy Church, that thus I might have both the certainty that they are thine, and the merit of bowing down my reason to the deepest of mysteries. I believe then, O Jesus! Help the weakness of my faith. 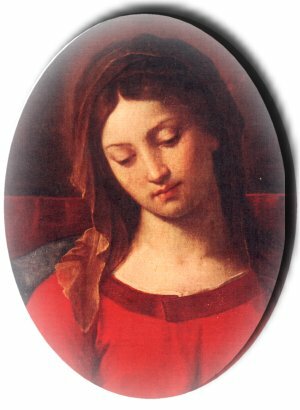 Enable me to submit, as Mary did, to thy infinite wisdom; and since thou desirest to enter under my roof, I bow down my whole being before thee, using her blessed words: 'May it be done to me according to thy word;' for how dare I, who am but nothingness, resist thee, who art all wisdom and power!